Only two medieval houses have survived in Amsterdam. The oldest dates back to 1420, at number 34 Begijnhof. The other one is at number 1 Zeedijk, Tasting House In ‘t Aepjen. Amsterdam was founded in 1306. To be more precise that is the year city rights were granted. Few buildings from this period remain because in 1421 a fire destroyed two-thirds of the city. When in 1452 another blaze swept through the city, legislation was passed banning the use of wood as building material. Begijnhof is a secluded court surrounded by a huddle of 17th and 18th century houses overlooking a central green. This court was founded in the 14th century as a home for Beguines, an order of lay nuns who educated the poor and cared for the sick in return for lodging within the complex. Only the Houten Huys, the wooden house, survives of the earliest cottages which consisted of brick and wooden buildings. In ‘t Aepjen (at the Monkey) is Amsterdam’s oldest pub and started life as a hostel for seamen. The innkeeper allowed sailors to pay their drinking and gambling debts by leaving a monkey behind, which they had brought back from the Dutch East Indies. It was not long before the hostel was infested with monkeys and fleas. Sailors lodging in this hostel were easy to spot as they were scratching themselves madly and truly seemed to be in trouble. The Dutch still have a saying: in de aap gelogeerd which translates as, spent the night in the monkey and means that someone is in difficulty. Nowadays, in ‘t Aepjen is a popular pub crammed with antiques and leather armchairs, but leave your monkey at home as it is cash only. 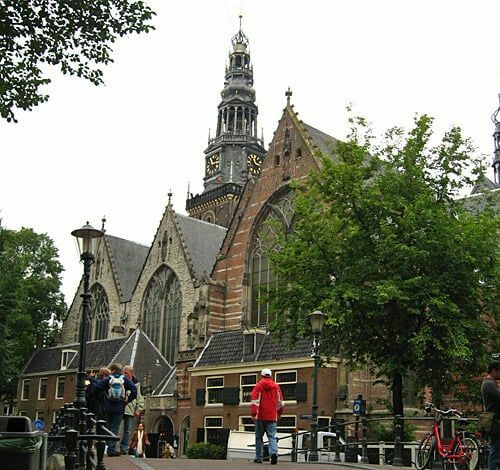 Amsterdam’s oldest monument is the Oude Kerk, Old Church, right in the middle of the Red Light District. The building of the church started in 1250. Its yawning interior served many functions. Peddlers set up stalls in the aisles and merchants negotiated deals. It was a gathering place for travellers and gave shelter to the homeless. Pilgrims came in the thousands after a miracle occurred. They provided the church with extra funds which were used to build aisles, chapels and more towers. More than 10,000 people were buried in the Old Church and the floor is covered with tomb stones. One tomb might contain up to four graves because the dead lie buried on top of each other. Wander through the church and notice many interesting details. A secret door at the back of the church leads to the iron chapel, a former hiding place for important city documents. The oak-encased Vater-Müller organ is surrounded by wooden statues of biblical figures. Composer and organist Sweelinck was the church’s main organist. An inscription on the lintel above the door of the former sacristy warns those about to get married: marry in haste repent at leisure. The former weighing house, now café-restaurant In De Waag, dates back to 1488. This multi-turreted building started out as one of Amsterdam’s fortified gates. Later on it was turned into the municipal weighing house. The upstairs rooms were used by the surgeons’ guild who held here public dissections which Rembrandt portrayed in his painting, The Anatomy Lesson of Dr Nicolaes Tulp. At one time, De Waag stored the city’s archives and in Napoleonic days Nieuwmarkt Square in front of the de Waag served as the public execution place. Today, the Waag is a haunt for gourmets, a top class café-restaurant with outdoor seating in summer.